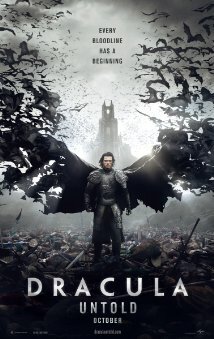 Universal Pictures opens Dracula Untold at nationwide on October 10th, 2014. NYC MOVIE GURU: What were the challenging in bringing Dracula Untold into fruition? Gary Shore: When I first got the script, I had a little bit of skepticism. Like, do we really need to see another Dracula film? I remember opening the script, having a read, and it was a very quick read---it was about 95 pages long---and it was just such a left field approach. There were a couple of characters there that weren't in the final film. NYC MOVIE GURU: What was it like to shoot the film in Ireland? GS: It's quite rare when you get a film of this scale to shoot in Ireland. When I started shooting, everyone thought I was just some sort of tax break. They hire you to get 10% off. I actually have to go to LA and prove myself. It's just a coincidence that we shot in Ireland. We were originally looking to shoot in Romania. It was amazing because my family was able to come up for the weekend. NYC MOVIE GURU: How do you feel about the fact that Dracula Untold isn't in 3D? GS: I'm extremely relieved that this wasn't in 3D. It didn't need to be in 3D. The studio never pushed it on me. We shot everything on film and wanted it to feel as grounded as possible. The nature is pure entertainment, but still the approach was a lot more classical. NYC MOVIE GURU: What do you think makes Dracula so iconic? GS: What really captured people's imagination at the time when the book was written was that it was almost like the reality TV of that time. It was a literary version of reality TV. People felt that reading this is a first-person experience. It was a success and because of that there was an immersiveness about it. The fascination about Vlad was happening while he was still alive. The German printing press was created around the same time, so it captured people's imagination. Everyone has a version of Dracula's story that gets handed down and it gets transformed throughout the years. With this film, we're taking seeds from history, but we're expanding from it into something that grows into pure fiction. NYC MOVIE GURU: Why do you think the public finds films set in medieval times to be so appealing? GS: I don't know. It's probably a coincidence. It's a brutal time when life was very cheap.